UDM Downloads > Batch Convert Images with 123FileConvert! 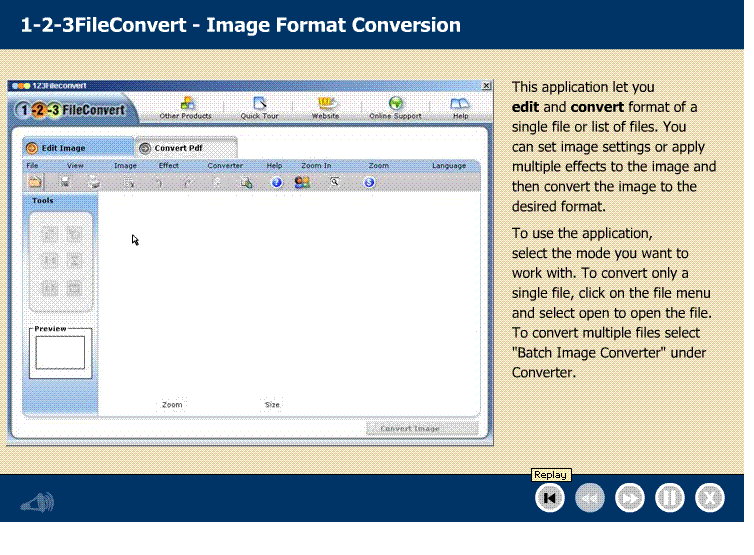 1-2-3 File Convert: Image Conversion Software. With 1-2-3 File Convert you can convert and edit images to various image formats. Also, edit and resize images using special effects. You can batch convert images, and also, the image editing function of this file converter provides versatile image editing features like rotate, crop, flip and resize tools. The Image Conversion is an efficient way to export graphic files to 30 file formats. Highlights of Image Conversion: - Batch Convert images in many supported graphic formats. - All popular graphic formats like JPEG, GIF, PNG, AVS, TIFF, and BMP are supported. - Edit and resize Images. - It can convert even heavy images upto 10MB in size. - Apply special effects to your digital images like: Gaussian Blur, Solarize, Raise, Border, Emboss and Charcoal. - Image Transformations like Rotate, Flip, Scale, Crop, and Mirror to your images. - Comprehensive viewing options allow you to zoom in and out. - Extremely Fast Batch Conversion.